New Delhi : 55-year-old Mr. Ashwini Marwah was gaining weight for the last few years. He was also suffering from type 2 diabetes mellitus (T2DM) and hypertension. This prompted the patient to consider bariatric surgery. 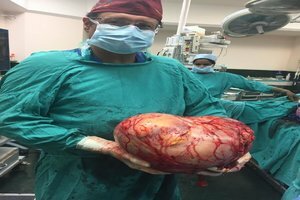 During evaluation and investigations by Dr Anoop Mishra, Chairman, Fortis C-DOC, he was found to have a large abdominal tumor of size 30X25 cms completely occupying the right side of the abdomen and also crossing over to the left side. He was unaware of the tumour and except for causing an increase in his weight, dragging sensation and heaviness on the right side of the abdomen he was presently asymptomatic .The location of tumor was adjacent to vital organs particularly Kidney, Inferior Venacava and intestines. He was refereed to Dr Randeep Wadhawan, Director, MAS, Bariatric & GI Surgery at Fortis Flt. Lt. Rajan Dhall Hospital, Vasant Kunj (FHVK). According to Dr Wadhawan “there are increasing incidence of large adrenal myelolipoma (>10cm) presenting with life threatening and recurrent retroperitoneal hemorrhage leading to complications such as abscess and rupture. In case of Mr. Ashwini, with body mass index (BMI) of 48, diabetes Mellitus, hypertension and early changes of Nephropathy, he was a high risk candidate for surgery. He was evaluated extensively prior to surgery. We had to make a large incision on his abdomen in view of the giant size of the tumor. 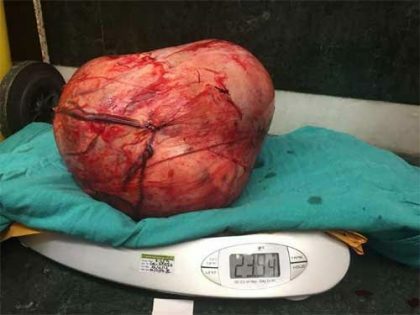 The tumor on removal weighed 11.5kgs, making it the largest adrenal myelolipoma ever to be excised. It was also highly vascular and attached to Right Kidney, Inferior Venacava and intestines. The biggest challenge in his case was to salvage his right kidney since his kidney functions were already affected due to his comorbidities like diabetes and hypertension. Histopathology of the tumor confirmed the diagnosis of adrenal myelolipoma. The largest tumors to have been reported in India so far weighed 6 kgs and was removed in 2003. The largest adrenal adenoma, which is one the differential diagnosis for the adrenal tumors, removed in the world weighed 7.5 kgs and was removed from a patient in 2013 claiming it to be the largest adrenal tumor to have been removed before the one found inside Mr. Marwah. Adrenal myelolipoma is a very rare benign tumor, which contains mature adipose tissue and variable amounts of haematopoietic, elements. Most lesions are small and asymptomatic and discovered incidentally. It is usually small, asymptomatic and non-functional in nature with an overall incidence of 0.05-0.2%.